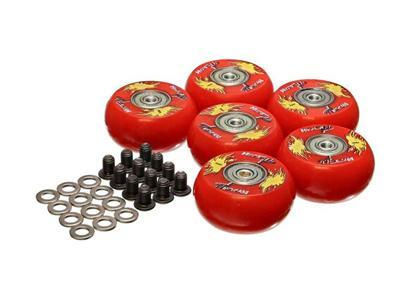 Made of superior formulation HYPER-FLEX polyurethane and uses high precision bearings. Experience little or no rolling resistance! The unique polyurethane material and design allows smooth, unimpeded rolling for indoor/outdoor ease of movement– over cracks, washers, misc. debris, etc. Fits Most Standard Caster Assemblies. Available in red or black with Cool Side Graphics. Rides on precision ABEC high quality bearings. Installs in a few minutes with two 5/32” hex wrenches (not included).